While we're on the topic of the minimalist approach to editing a wardrobe, I decided to play around with Polyvore and create an entire capsule wardrobe from scratch. It took me a couple of weeks to do this without straying from these 5 rules (remember my last post?) - Figure, lifestyle, affordability, versatility and personality. This is a great exercise to see what I've got and the gaps I need to fill. Be warned, this is a very photo heavy post. I already own some of the pieces shown here and am hoping to pick up the rest over time. I'm one of those individuals that can't operate without a list. Especially when it comes to shopping. It's that insect-like attention span that I have. That's why I love internet shopping. Looking for sweaters? No problem. Just look for that drop down box and click on knitwear and voila, a whole spectrum of sweaters in every shape, design and price. The first time I visited South Coast Plaza in California, I was so overwhelmed by the sheer number and size of the shops that I promptly parked my fanny on a comfy armchair at Barnes & Noble until closing time. I've learned to figure out which designers or brands suit me best. 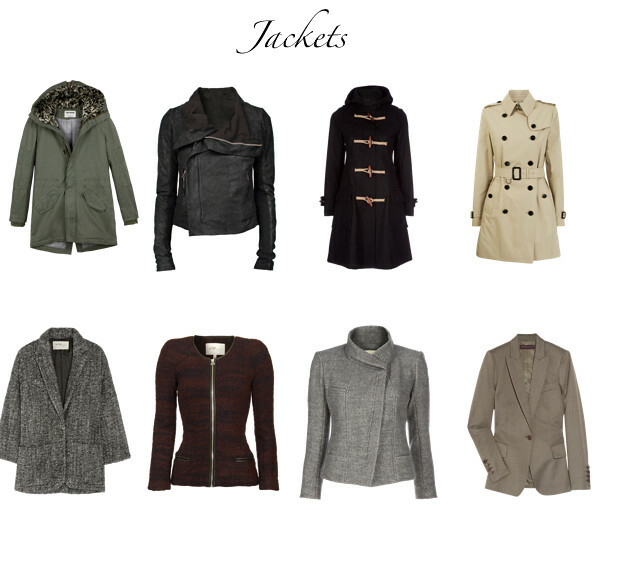 For jackets, I go to Banana Republic and Isabel Marant. Uniqlo for sweaters, denim and pants. Petit Bateau for basic tops. 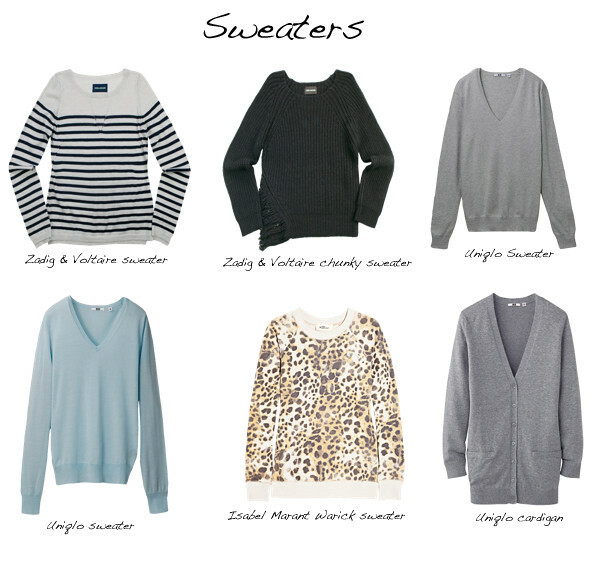 Zadig & Voltaire and Comptoir des Cotonniers for sweaters, dresses and fancier tops. 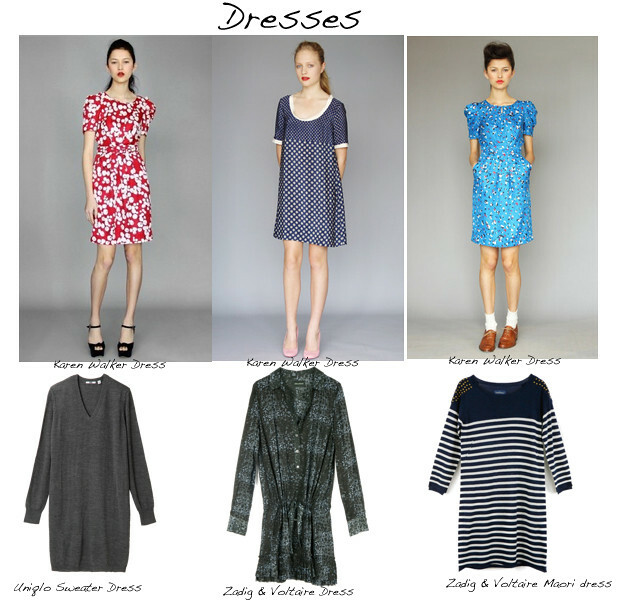 Karen Walker for feminine dresses. I'm not one to go through racks and try on multiple pieces. The only fitting room I like after 2 decades of shopping for myself is the one at Harvey Nichols. Spacious, queue free and perfect lighting. Who likes to be squeezed into a doll sized room with only one hook for your clothes and harsh lighting that shows every zit, pore and wrinkle? i love this!! this is pretty ingenious.. i try to make lists in my little moleskine that i bring with me everywhere.. and to keep myself from buying duplicates of things.. whenever i have the urge to buy something "pricey" i take my book out and review it.. hahahaha. it doesn't ALWAYS work.. but it's been somewhat helpful hahaha. I'm a pill--because I can't wait for you to do more work and show me the jackets! :) I mean that very warmly--of anyone's wardrobe choices, I love your jacket collection above all others. 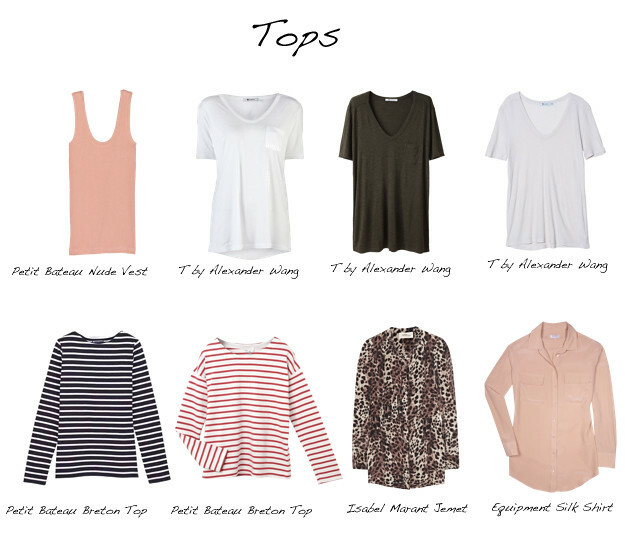 A very wearable and acheivable capsule wardrobe you've created here--and I imagine in real life. It's simple but luxurious, and that's a chic combination to pull off. I hope Paris was amazing and can't wait to read about it. Until then, thank you for the offer re: Church's. Big hug for that. Church's are my version of your Repetto above. I think I'm going to focus on loafers and brogues for a while, which fortunately we can get in the States--and even if they are expensive, they are such a good value. This is such a fun post! I have to bookmark it to pour over in more detail later. What's the scarf posted under accessories? It's lovely! I-Ping, it's titled Cent Plis des Miao which is basically a drawing of the traditional skirts worn by the different Miao tribes in China. Another brilliant post, I have to make list for shopping too and I love online shopping, I hate trailing form store to store. Oh that Kelly bag, I so want one and I so will never have one! Thank you! I think this is going to be one of my grail scarves! I think you'll love this design. I've seen some of these Miao skirts in real life and boy, the artist has done a fantastic job. I also love making lists, the only problem is sticking to them. Currently, I am trying out the 5 piece French wardrobe, that means I can only buy about 10 piece of quality items for my wardrobe in a year. Let's hope it works for me. you have great set and i love your choices you have great style.. i like them, they're simple but stunning!!!! These boxes look like the stuff of my dreams! Just perfect! The only time I make a list is when I go to grocery store but this sounds like a great idea. I never about that with clothes. I just realize that my wardrobe is lacking basic pieces, let alone good quality ones so I should focus more on building staple pieces first. Thank for this post, Marlene, reading your tips is really refreshing. Happy New Year M! I love this visual capsule. We are currently in the process of renovating our new house so everything is literally in boxes. Once completed though I will have a better idea of my clothes collection =) Meanwhile my excuse to hubby for shopping is that I can't find X, seems to be working at the moment. I am so honored that you asked me about my make-up routine, I am def. not a make-up guru nor do I know much about it. I just try to find the simplest way to apply it b/c as a fellow mother, we don't really have much time on our hands! But the short answer for now in regards to my lip color is NARS Belle de Jour which I got a sample tube in Sephora that has lasted me almost 2 months now. I'll take one of each! This post looks like a raid of my fantasy closet. I wish I had Uniglo down here. :( You are very naughty, too. You had me wishing I had gotten the Warick sweatshirt now. When I called IM in New York, they had just sold the last one in my size. Pooh. T by Alexander Wang has been a favorite of mine for a while now! Maria, I was lucky to nab one of the few remaining ones on NAP when they were slashed down by 75%. I never thought how comfortable and versatile it is. Fingers crossed one will turn up for you. I wonder why Uniqlo doesn't have an online store in the US. I hardly ever go to their store. Madhouse! It's great to hear from you, Linda! Such a great idea M! 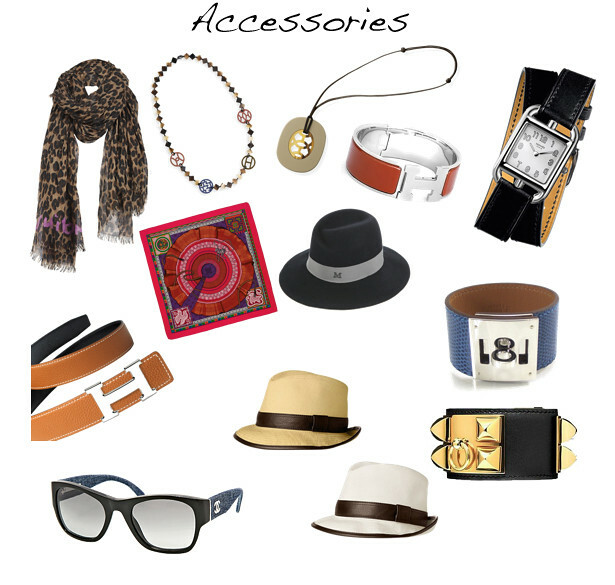 It really shows how a select handful of items can make a fantastic wardrobe that's versatile. 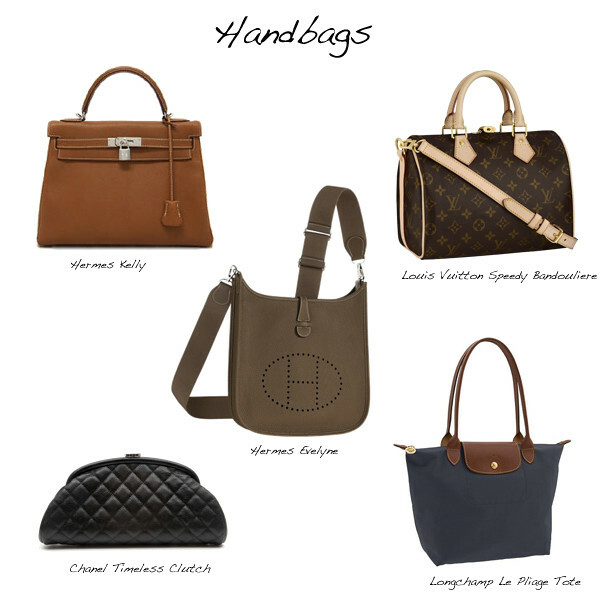 You have my knees going weak for the bags and accessories! What a dream list! I can't wait to pop back so we can go for a shopping jaunt in London again. Maybe Paris next time to? Fingers crossed you'll be able to make it back middle of this year. I certainly have missed our chats. Love the Polyvor sets!!! Still reading your post slowly! Great job there M! WOW. Thank you for reading my mind re every aspect of this list!!! Thank you for this post. It's great. I love pouring over all of the items here. There's so much that can be done with these items.